The second-annual Western States Ranch Rodeo Association National Finals was held November 3-6, 2011 at the Winnemucca Events Complex in Winnemucca, Nevada. 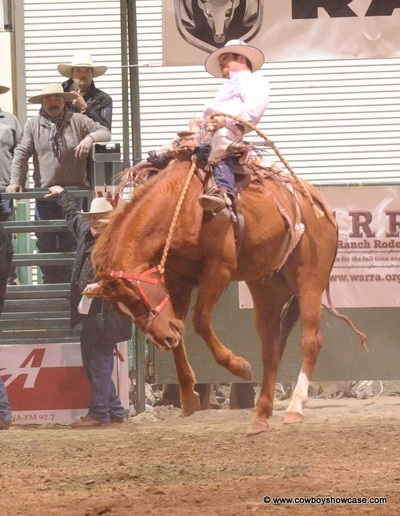 In 2011, WSRRA sanctioned 32 ranch rodeos and more than 20 ranch-bronc riding events in nine Western States, including California, Idaho, Montana, Nebraska, Nevada, Oregon, Utah and Washington. The top 30 teams and individual competitors in sanctioned events competed for more than $40,000 in cash and prizes at the National Finals. 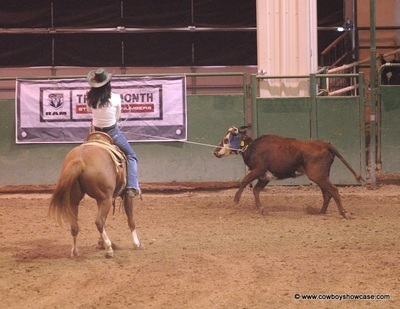 The top 30 four-person teams competed in two rounds of events resembling everyday ranch work–branding, doctoring, tie-down steer roping, and trailer loading. The top 10 teams came back on Sunday for the final round. Champion team is the Hairpin Ranch Team with members Jason Ward, Dillon, MT; Casey Brunson, Gooding, ID; Ike Folsom, Dillon, MT; and Jade Stoddard, Rexburg, ID. 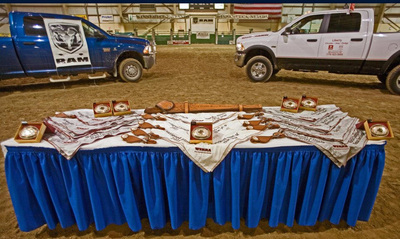 Along with Gist buckles they received prizes including chinks from Carlos Macias of Buckaroo Gear.com. r the World Champion Ranch Team chinks The reserve champions are the Jim Ranch team with members Gene Curtis, Daxton Jim, Dirk Jim, and Ira Walker, all from Owyhee, Nevada. Champion Hairpin Ranch team in the trailer loading event. Rodeo Top Hand award went to John Ward from Dillion, MT, a member of the winning Hairpin Ranch team. All Around Ranch Horse is Colonels Gold Penny ridden by Wyatt Bourdet in the Working Ranch Horse event and on the 24/7 Livestock ranch team. 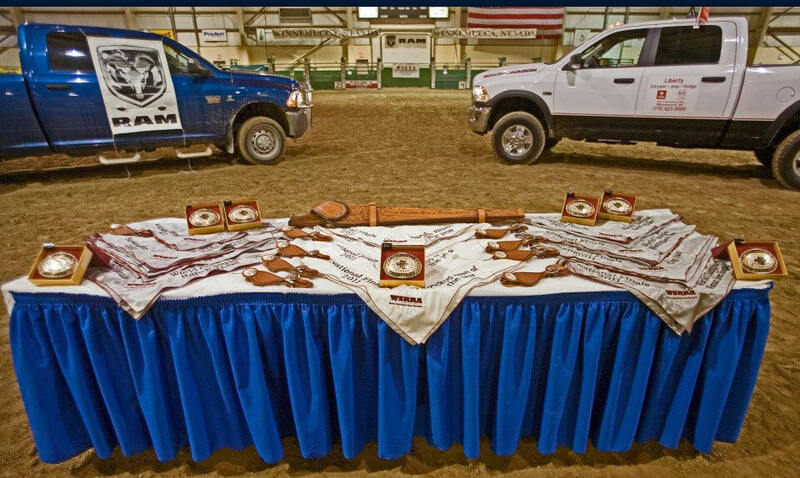 Besides the team events, the top 30 contestants from each of the sanctioned events of stock-saddle bronc riding, women’s steer stopping and ranch-horse competition, based on points accumulated at WSRRA-sanctioned events throughout the year, also competed in two rounds. The top 10 came back for the final short round on the last day. The WSRRA Finals hosted the largest stock-saddle bronc riding in the West, bucking over 90 broncs from five top stock contractors. 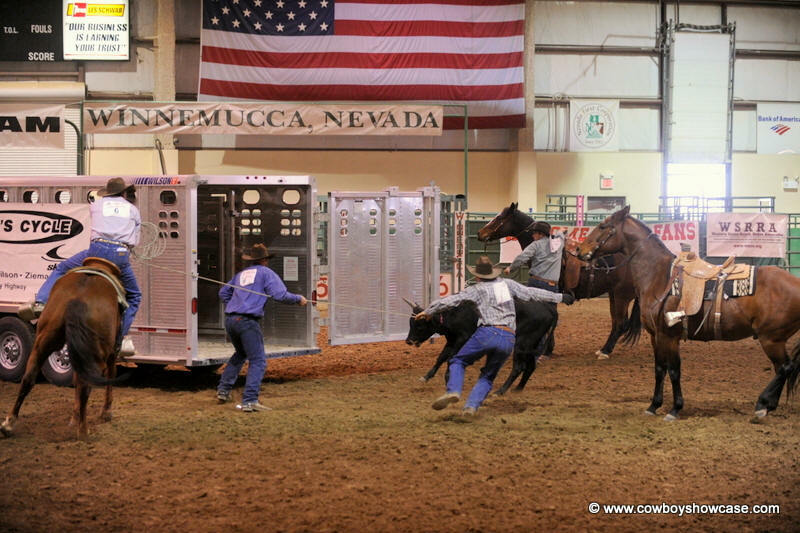 Stock contractors were Wes Clegg, 7-C Buckers, Tooele,Utah; Blossom Ranch, Duck Valley, Nevada; Nathan Pudsey, Circle P Rodeo Company, Yerington, Nevada; Glen Shelley, Shelley’s Ranch Broncs, Burns, Oregon; and Dave Hoggan, Hoggan Rodeo Company, Dubois, Idaho. 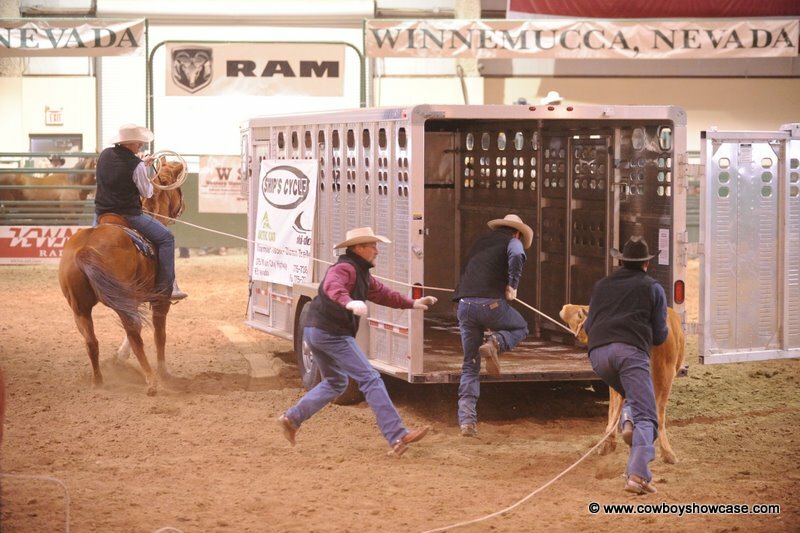 Top Bronc of the Year is Broken Box from Shelley’s Ranch Broncs, Burns, Oregon. Vade Arnzen on "Broken Box"
World Champion Ranch Bronc Rider is Dalton Jim, Owyhee, NV, and reserve champion is Wyatt Duncan. 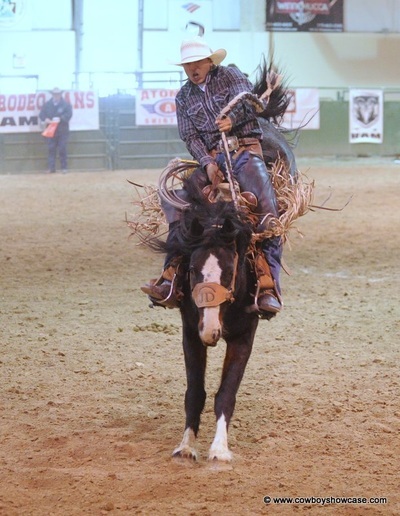 The champion bronc rider received a vintage 30-30 rifle donated by Cowboy Showcase in a custom-carved scabbard from Bud Shaul Saddlery along with a Gist buckle and other prizes. 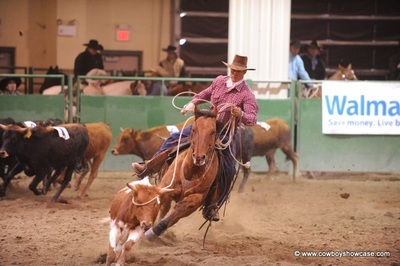 World Champion Ranch Horse is CD Hen House, ridden by Brandon Buttars of Snowville, UT, who received prizes including a Gist buckle and Rommel Reins by Dan Fowler. 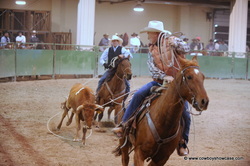 Reserve champion, Fairlea Steady Betty, was ridden by Darrell Norcutt. World Champion Women's Steer Stopper is Mindy Goemmer, Battle Mountain, NV and reserve champion is Kathy Bengoa. 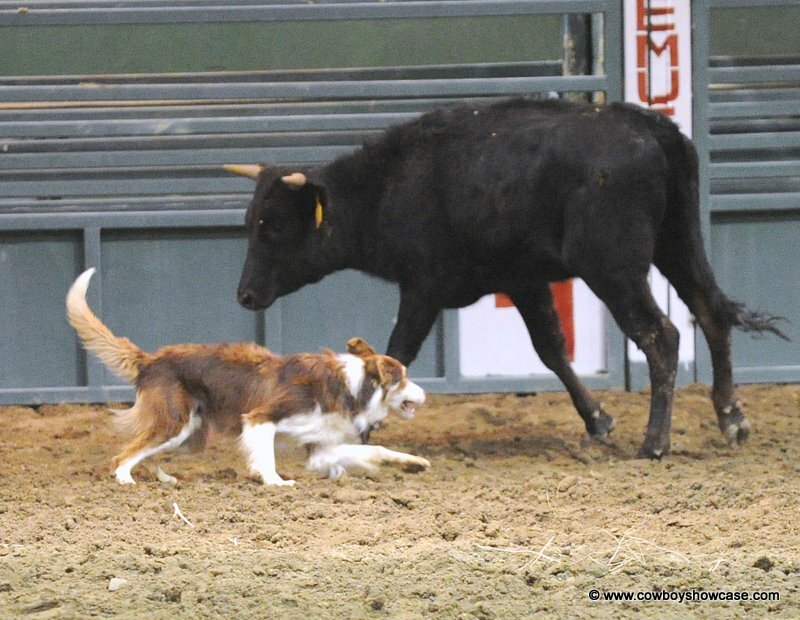 New this year was the WSRRA Ranch Dog Challenge on Thursday, November 2, which featured some of the best working dogs in the West. Open Class-1. Sharon Edsall and Mocha; 2. Robin Nuffer and Heidi. Ranch-Cowboy Class-1. Ty Openshaw and Zeke; 2. Ricarda Braatz and Annie. Overall Ranch Dog-1.Ty Openshaw and Zeke; 2. Sharon Edsall and Mocha; 3. Robin Nuffer and Heidi; 4. Ricarda Braatz and Annie. Dog with Heart Awards: Rosi Stoddart and Dezi; and Lisa Bedell and Pepper. The Buckaroo Christmas Gear and Trade Show offered a wide selection of custom gear and western products from more than 40 vendors. A silent auction was held to benefit the “Papa” John Lewis Cowboy Crisis Fund. Established in 2009, the Western States Ranch Rodeo Association is one of the most popular rodeo circuits for cowboys and cowgirl of all ages, levels, and occupations to showcase their stock horses and ranch skills. The association currently boasts over 500 members. The association was formed to preserve the ranching traditions of the West, allowing the full-time and the average day-working cowboys, working men and women, to have an opportunity to compete in sanctioned ranch-rodeo events. WSRRA sponsors include Boot Barn, Buckaroo Country Photos by Mary Williams Hyde, www.BuckarooGear.com, Bud Shaul Saddlery, Clark Saddle Co., www.CowboyShowcase.com, Cowboy’s Digest, Dodge Ram Trucks, Gist Silversmiths, Les Schwab Tires, North Valley Hat Company, Ranch Life Photography by Victoria Boyd, Ranch World Ads Magazine, Teague Motor Co., The Winnemucca Inn, The Cowboy Way Magazine, Western Horseman Magazine and Working Ranch Magazine.